It's always been a challenge to find cool cycling gifts. That's part of the reason I started Skeese Greets. But now with the new online cycling gift store, Flower Pedal the task has become easier. They've got everything from bike jewelry and clocks to pajamas and hand towels - all in one place. 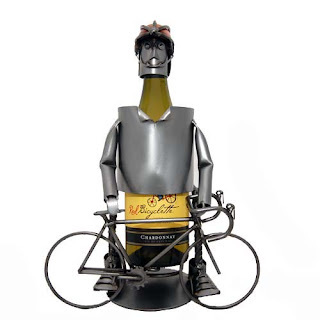 They even have harder to find stuff like this biker wine caddy. And soon they'll have a nice selection of Skeese Greets bicycle birthday cards, thank you cards and everyday cards packaged in sets of 10. They're adding new products and other fun stuff to the site every day, so check back often.